The District looks to the Citizen’s Advisory Committee for input on District programming and needs within our communities. The committee is also responsible for providing recommendations to the Board for the District’s annual budget, community grants and scholarship programs. Each member is a Boone County resident and represents various areas of waste management, environmental business and in general, is an active citizen. In March of 2018, the District was awarded the Boone County Chamber Impact Award. * Denotes joint meetings between the Executive Board and the Citizen's Advisory Committee as they provide regular updates/recommendations to the board. 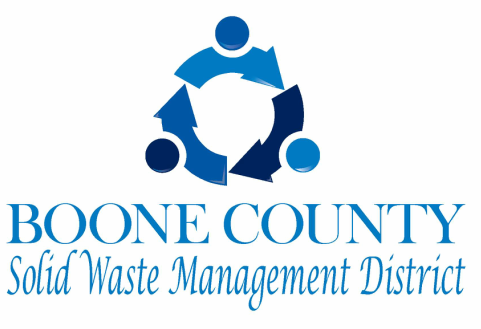 ﻿﻿﻿﻿﻿The Boone County Solid Waste Management is funded through a combination of revenue streams including a special assessment, a clean fill tipping fee and interest on investment. Each of this revenue streams are not currently on the tax rolls. The special assessment consists of a monthly fee of $0.40/month on residential accounts and $0.40/cubic yard on commercial accounts. This fee is collected by the solid waste haulers offering business within the County. A 10% rebate is provided back to the solid waste hauler to cover the administrative costs of collecting the additional fee on their bills. The clean fill tipping fee consists of $0.50/ton charge when clean fill material is hauled to a final disposal site located within the County.